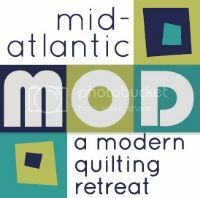 Philadelphia Modern Quilt Guild: Good times at The White Oak Bed & Breakfast Quilt Retreat! Good times at The White Oak Bed & Breakfast Quilt Retreat! Anna and Stephanie enjoying some peaceful sewing time! The retreat was held at White Oak Bed & Breakfast in Strasburg, PA from September 30 – October 1st. Anna, Stephanie and Cathy were in attendance and all would do it again. Everyone arrived on Friday afternoon, had a great dinner and then set up their machines for an evening of sewing. The last person didn't go to bed until about midnight! A big breakfast was served on Saturday before going back to sewing. Although no one was hungry, lunch was served and then the decision was made to do go out & do a little fabric shopping (to burn off some calories). The fabric stores in the area have great prices and everyone did their part to support the economy. Then they headed back to the B & B for more sewing. Anna had 4 quilt tops with her that needed borders, backs and batting. There were large areas to make quilt sandwiches and Anna took advantage of that. She was able to get all her quilts pinned for quilting. Stephanie had the pieces for her quilt cut so she worked on piecing and ironing, laid it all out on the floor & worked on assembling the quilt top. Cathy got her monochromatic quilt quilted and the binding on then started her new project. The innkeepers were so friendly and accommodating to our needs – you couldn’t have asked for more. There were discussions about future retreats and how to encourage more participation. It was so rewarding to have the time to work on a project without any distractions, you just need to try it! All of our hard work!! Looks like a lot of fun, I'm sorry I missed it! White Oak is the best. All you have to do all weekend is sew -- Rob and Carol take care of the rest. All of the projects look beautiful!